I made a knitting resolution, and I’m still working on it. 7 x 100 gramme balls of Patons Jet – 3 in dark green and 4 in light green. It’s a heavy aran weight yarn, a wool and alpaca blend, and I loved knitting with it and I loved the jumper I made. But it pilled more than any other yarn I’ve ever used. So accessories that wouldn’t get too much wear and tear were the order of the day. A hat and a long scarf. I’d knit the hat first, and then I could go on with the scarf until the yarn ran out. I knew the hat I wanted straight away – this one. I’d had my eye on it for a while, and I realised that if I made the lighter blue the dominant colour I would even up the amounts of the two shades for the scarf. The hat I made is lovely, and it’s been my hat of choice ever since it came off the needles, but I was disappointed in the pattern. 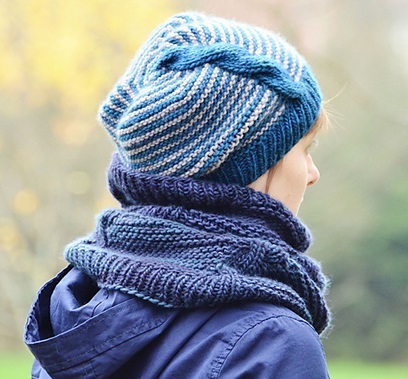 It wasn’t at all clear, and I was glad that I was familiar with hat construction – I changed the cable a little and I gave up trying to make sense of the instructions for the crown shaping and did my own thing. I’m afraid that once she’d had her supper and evening walk she wasn’t much interested in smiling for the camera. And I’m pleased to say that the slouch/drape thing works much better on a human head. I so to the scarf. 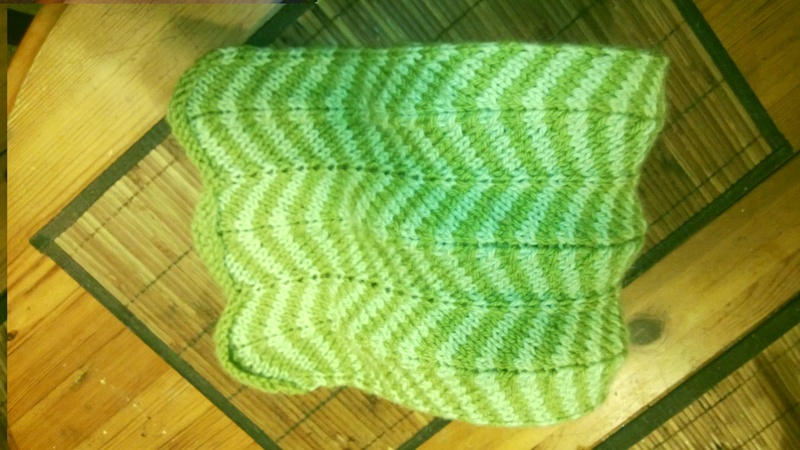 I had a scarf using the double knitting technique, but I didn’t enjoy it and the pattern wasn’t as effective as it should have been – it needed shades with more of a contrast. And so I set about looking for a pattern for a stripey scarf. There are lots out there, but I settled on this free pattern with a chevron design. I just changed the increases – from KF&B to M1R and M1L – because I thought it looked better. And I knitted and knitted and knitted until the scarf was more than six foot long and all of the yarn was gone. It was easy, mindless knitting. It’s rolled up for the moment, waiting for a cold day – the alpaca makes it wonderfully cosy. My next knitting resolution project will be to turn two balls of purple yarn – leftovers from a jumper into another hat. And after that I have a shawl pattern in mind for some yarn my mother bought for a bolero that she gave up on …. Beautiful work! 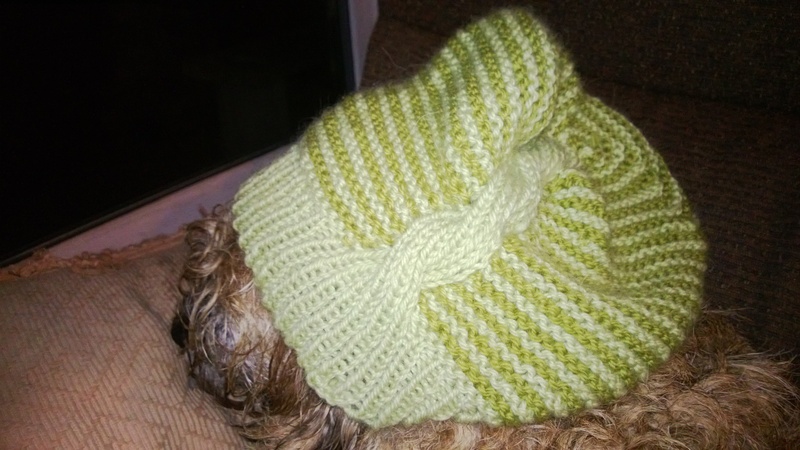 I found that a hat I made with alpaca was very itchy and I gave it away. The blend probably is better for a hat. Lovely colors. You do such lovely work! Both hat and scarf are superb. Still plugging away at socks here. All mine got thinnish at the same time. Lovely – I bet the model was a bit grumpy about having to wear the hat! The green colours are lovely. Love the colour, Jane! Just the thing for the transition into Spring. For those of us here in Ontario the wait will be soooo much longer – it’s -31C with the windchill today. Love the pattern of the hat. So pretty. I can see Briar was definitely impressed.